In this part of the Global Blogging Survey I asked some personal information about yourself. The aim was to get an idea of the sorts of people who blog, and to see if the “young male geek” stereotype was true. To be honest I was expecting the male/female balance to be more even. Many of my clients, twitter and blogging contacts are female, and I see more female bloggers now than I ever have. While I did expect males to be higher, I never anticipated it would still be to this degree. USA still clearly has the lions share of bloggers. 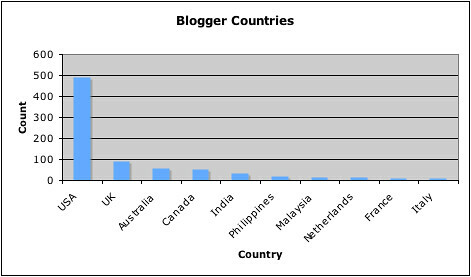 What you can’t see in this graph are all the countries with two or three bloggers responding. I do know that blogging is increasingly popular in non English speaking countries, so perhaps my readership skews? One to watch over coming years I think. My prediction is USA will lose the crown before long. 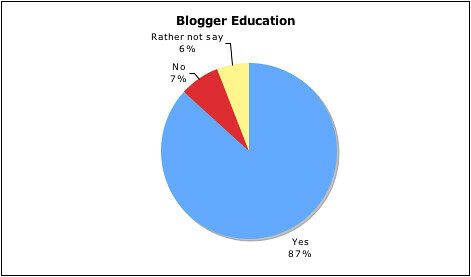 I fully expected bloggers to be an educated bunch and this proves it to be the case, kind of. Obviously this is my readership, which does not necessarily mean all bloggers fall into these groupings. You might be surprised to learn that while my readers are heavily in the “college and university educated” group, I myself never went to university. I left school as soon as I could, at age 15. How Old is the Typical Blogger? 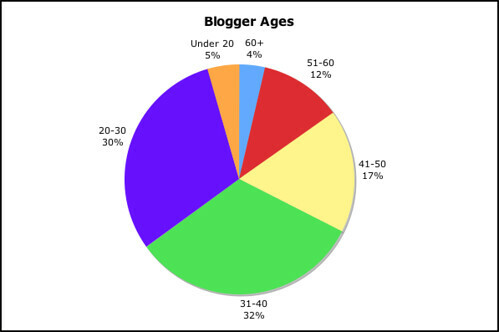 What would you guess at the average bloggers age? It seems there are as many bloggers over 40 as there are under 30. 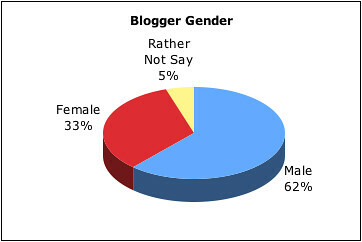 Are bloggers male American teenagers and students? Seems like while a portion could well be, bloggers do not fit tidily into that stereotype and are in fact a pretty diverse bunch. If you think that many bloggers will attract an audience a lot similar to their own demographic, this information shows there is quite a market for variety of people. It will be interesting to see not just a snapshot but a trend.